Jupiter: The fifth planet from the Sun, as seen at a distance of about 400 million miles. Caption: As the New Horizons spacecraft approached Jupiter en route to Pluto in February 2007, Chandra took exposures of the gas giant. In this composite image, Chandra data from three separate observations were combined, and then superimposed on an optical image of Jupiter from the Hubble Space Telescope. 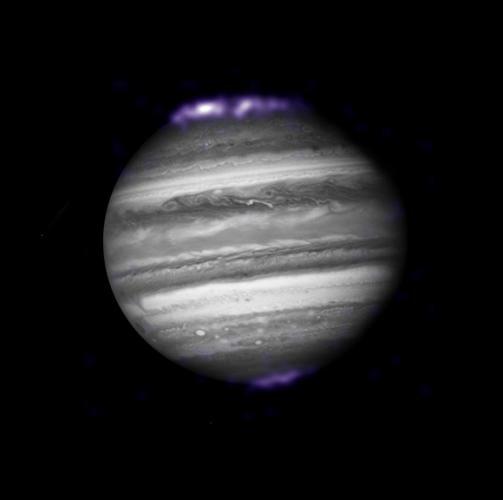 The purpose of the Chandra observations is to study the powerful X-ray auroras observed near the poles of Jupiter. Scale: Image is 61 arcsec across.